Ever wished you could turn off the phone call portion of your iPhone, while still retaining the ability to use data, access the internet, even send iMessages? You can do that with a funky workaround we’ll cover here, and it’s an amazing solution if you’re looking for some peace and quiet but in a situation where you still need to use your iPhones data connection and internet access. The other benefit? 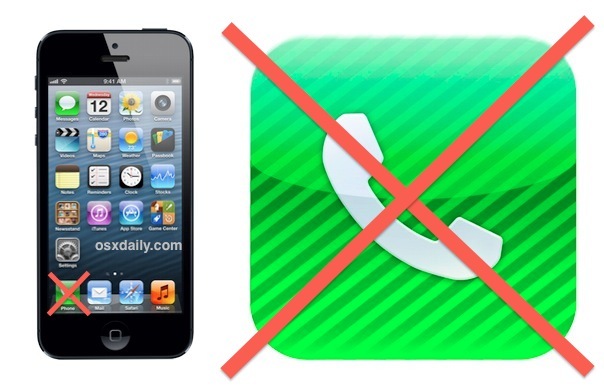 You can still make outbound phone calls, you just won’t receive any phone calls back to the iPhone itself. There’s no way to directly turn off just the phone portion of an iPhone, so instead we’ll use an alternate method to get the job done. This utilizes call forwarding to automatically send all incoming calls to either a nonexistent number (bringing total isolation, your phone will appear as if it has been turned off or is no longer accepting calls), or send all calls automatically to voicemail (this is better, because people can still leave you voicemail and you can still check them to see if it’s important). Maintaining cellular data usage is why this trick differs from just toggling AirPlane Mode, which turns off internet functionality and basically makes an iPhone into an iPod touch that is unable to reach the outside world at all. Do Not Disturb is different too, because although data usage remains intact, Do Not Disturb basically just mutes the phone and doesn’t actually prevent inbound calls from coming through to the phone, they are just silenced when the feature is on. Or you can go the alternate route and find a number that isn’t real or is out of service. Would you rather your iPhone sound as if it’s been disconnected or is no longer accepting calls? That’s easy, you just need to locate a phone number that doesn’t actually exist. Typically, any random area code followed by 555-5555 works, but you’ll want to call the number yourself first to be sure it’s not actually a real number. If you’re feeling funny, you could even forward your phone number to some weird service, 800 number, the person who is calling you nonstop and annoying you, or someone else… you get the idea, but that’s not what we’re covering here. Note about Call Forwarding for Verizon users: Verizon users often don’t have the “Call Forwarding” option built into iOS as described above. Instead, dial *72 followed by the phone number to forward to. You can then dial *73 at a later time to disable call forwarding and return to normal. You can always double-check the trick is functioning as intended by calling your number from someone else’s phone or by calling yourself from Skype or Google Voice. If you chose the voicemail option, the iPhone will appear as if it has been turned off or is out of service area and instead goes directly to your voice mail box, without you having to manually send each call there yourself. If you chose the nonexistent number option, the iPhone will appear as if the phone number is no longer in service at all as if it was canceled. You’ll know this is working because you’ll see the little Call Forward icon in the iOS menu bar, it looks like an old fashioned phone handset with an arrow pointing out of it. Data still works beautifully. Every internet-based app on the iPhone will work as intended. iMessage still works to send and receive messages. Skype works. Personal Hotspot even continues to work. The only difference is the iPhone will no longer take phone calls as long as call forwarding is active. Why isn’t there feature on the iPhone to begin with that would let us temporarily disable the phone? Who knows, but we’re glad to have a workaround, even if it is in the same quirky vein as creating blocked lists to stop calls from certain annoying numbers. When you’re all done zenning out in silence and want to receive phone calls again, you can just go back into Settings > Phone > Call Forwarding > and flip the switch to OFF. 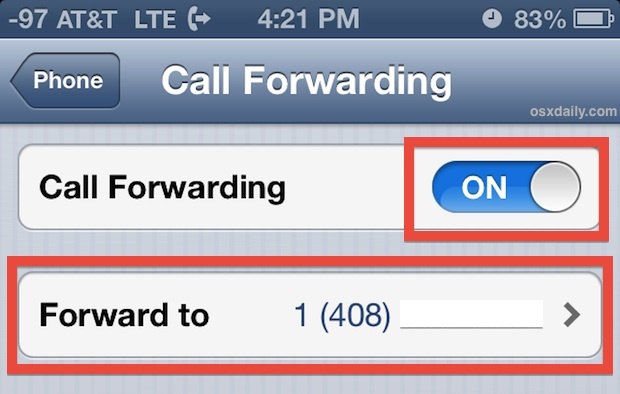 The iPhone will now take phone calls as usual, and the forwarding option will always be just another ON toggle away because the number becomes saved in the options. Enjoy your peace and quiet! Cheers to some helpful posts at ATT Forums and iLounge for the voicemail number retrieval trick. By the way, this will also work on phones other than iPhone by using *#67# to find the voicemail, then *21*number# to enable call forwarding. That manual approach to forwarding can be ended at any time by using ##002# to go back to normal again. Note that most Android phones have the Forwarding setting in their phone options so the manual trick is really only necessary for pre-smartphones. How can I delete the forward number and choose another one ? Oh wait. It does save it. Sorry! this was a very helpful article. Thank you very much. The technique described for finding out your VM # may work for AT&T but doesn’t seem to work for Verizon customers. If this is activated and someone rings me, will it come up saying I have a missed call from them or not? Thank you very much, this helped a lot unlike some spammy sites. I couldn’t get the voice mail number. when I pushed *#67# and then Call, I got a recording saying it was an incorrect code. An iPhone 5c on Verizon requires a call to customer service. 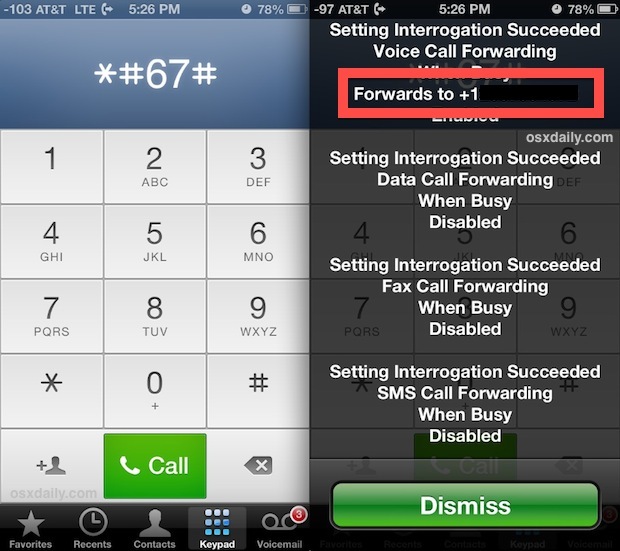 The configuration for managing Call Forward is available only through Verizon. It is an “all or none” option and cannot be enabled directly onto the phone for manual control by the user. Not ideal but at least it stops those annoying interruptions when you are on a call. Thanks. Just what I need! Do you have any ideas as to how to reject calls with “No Caller Id”? Wuuld be very interested in that. Or make it that these always go straight to Voicemail where one can put a message about rejectin No Caller Id calls. It doesn’t work. Ive tried more than 15 times. Just turn off “phone” under cellular data instead of all of this. Worked perfectly! Thanks for the easy to understand instructions! i Only want my i6s to ring when the calls are from people in my contact list. I want Random numbers and no caller I’d to go directly to voice mail. How can I do that??? I’m desperate to get rid of the 10 calls each day I receive from salesmen.